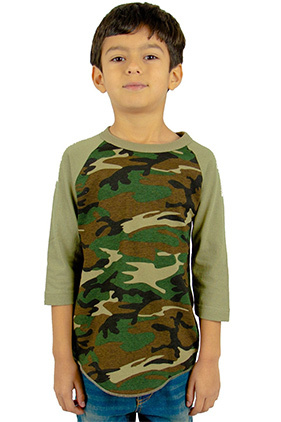 100% USA cotton, 5.8 ounce, 18 singles youth 3/4 sleeve raglan. Shoulder-to-shoulder neck tape. 1" double-needle stitched sleeve. Scalloped, merrowed bottom hem. Quarter-turned to eliminate center crease. Contrast raglan sleeves and neck binding. Tear away label. Heather Grey 90% USA cotton/10% polyester. Charcoal Grey 50% USA cotton/50% polyester.